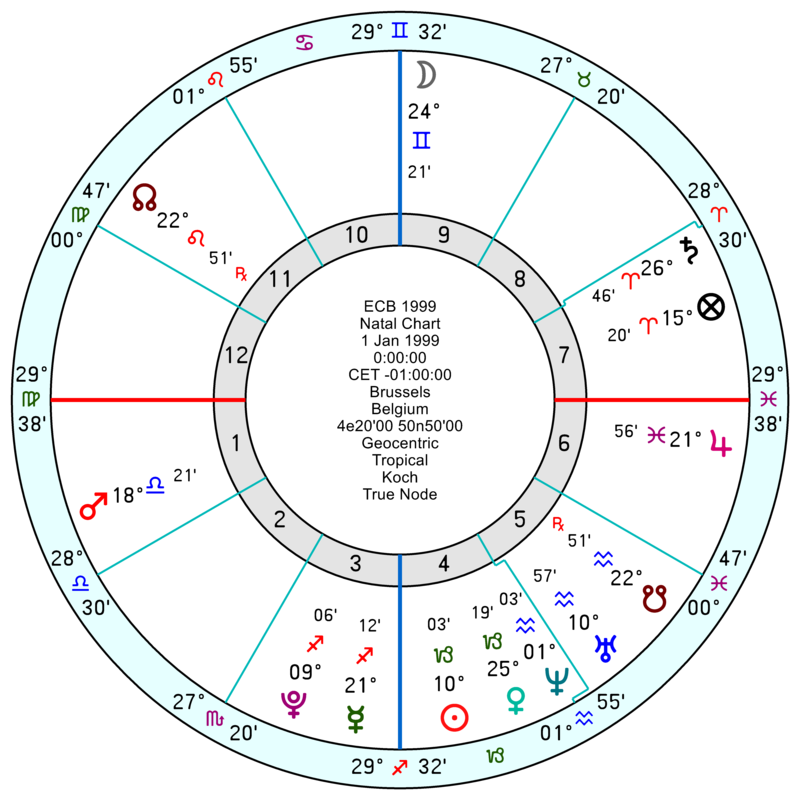 Tr Uranus is moving to oppose the EU’s 2nd house financial Neptune from just after mid this May onwards to coincide with the key elections which could shift the balance of power in the EU Parliament at a time when there are ominous signs of a slowdown economically. This will apart from anything else be nerve stretched and probably leading to misjudgments. Plus the Solar Arc Pluto is conjunct the EU Neptune exact in two months’ time which can accompany devastation and confusion, again focussed on finances. What will make the impact of the Uranus transit greater is that the EU Neptune opposes an 8th house Taurus Moon and squares an 11th house Uranus – so there will be a high-voltage shock coming for the EU, involving internal and external finances as well as future plans and friends. This phase will continue on for several years, amplifying from mid 2020 onwards as tr Uranus is then starting to conjunct the EU Moon for a major emotional and financial upset and is also in a crossroads-moment as it squares the EU Uranus. There will be (excitable and bruising) discussions about ambitions for the future. Even before then there’s a seriously stuck, road-blocked Solar Arc Midheaven conjunct Pluto exact in six months’ time; and a swampy, panicky and dissolving tr Neptune square the EU Saturn picking up from late March 2020 running into 2021. And in 2021 there’s a mighty collision from the Solar Arc Mars square the Moon and opposition the EU Uranus – which will shake the institution to its foundations. 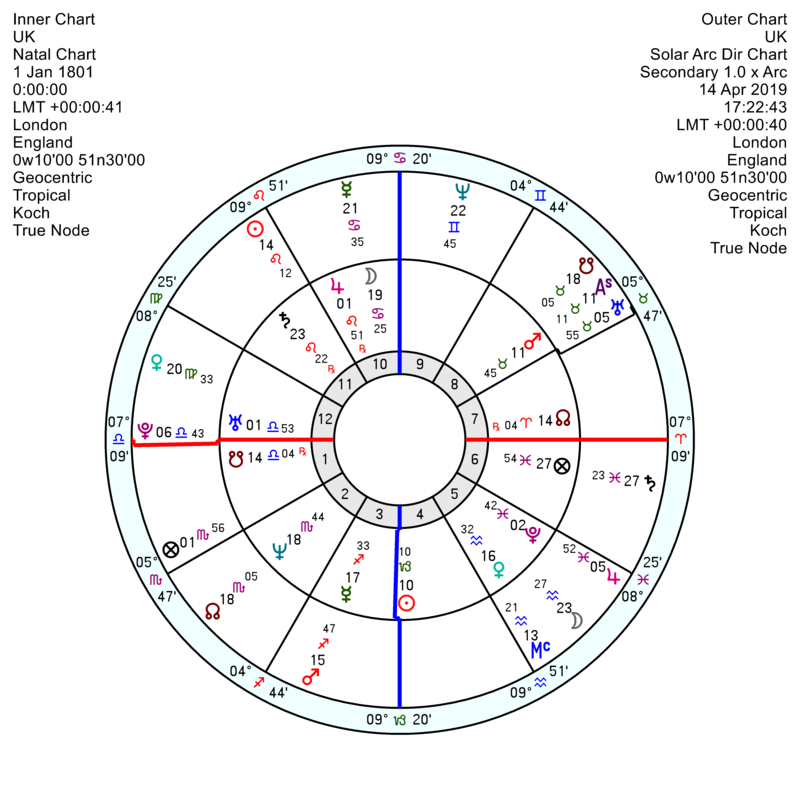 The UK is in a dithering muddle now and into 2020 with tr Neptune square the UK Mercury and the Saturn/Node midpoint as well as square the Solar Arc Mars. There is some sense of separation from tr Saturn square the Sun/Moon midpoint in August and October though that is mild enough. 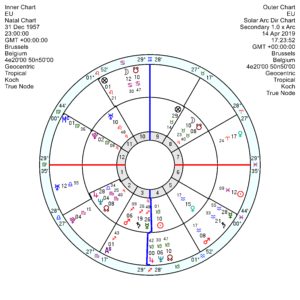 With a shift of sorts as tr Uranus is sextile the UK Pluto this month and over the New Year. The EU also gets this aspect from Uranus; and both the UK and EU have their Sun in the line of fire of this July’s Solar Eclipse, which usually produces a crisis/and a direction-changing event. 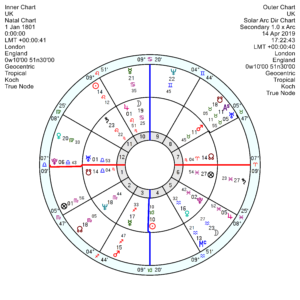 But the UK doesn’t really shudder under the weight of major influences until mid 2021 when tr Uranus starts to conjunct the UK 8th house Mars which is an especially sensitive point in the chart, often coinciding with accidents and disasters, as well as financial ups and downs. In 2021 as well there is an aggravated Solar Arc Mars conjunct the UK Mercury for running arguments and perhaps transport difficulties. By late 2022 a pressured and blocked Solar Arc Pluto square the UK Sun. Finances are likely to be a fraught area for the UK and on a roller coaster ride from 2021 for several years thereafter as tr Uranus moves through the UK 8th house till 2026. 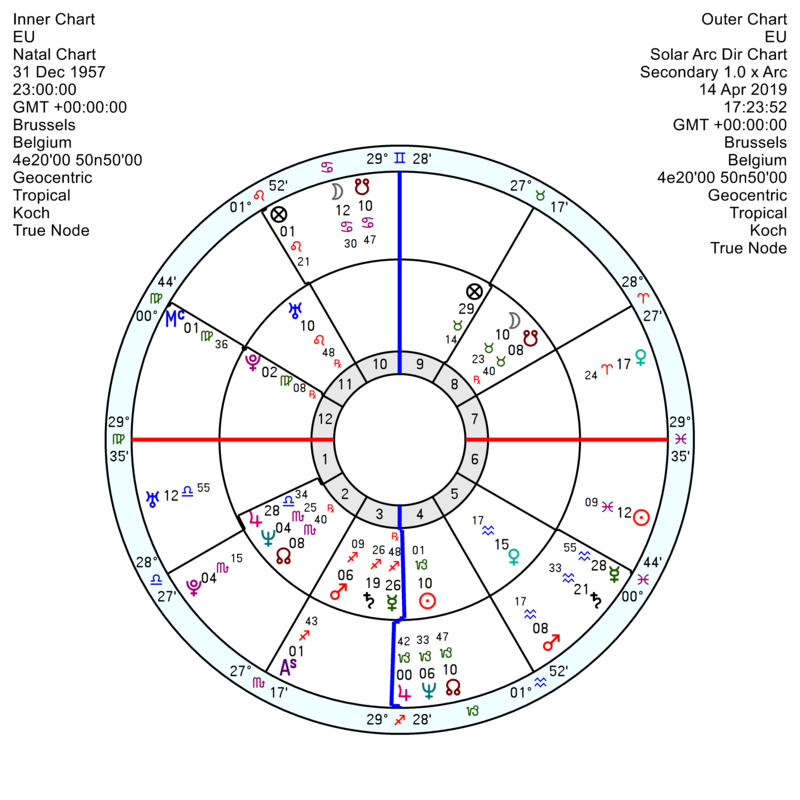 And since tr Uranus is in hard aspect to the four Fixed planets in the UK chart which form a wide Grand Cross, there will be an impetus for change blowing through the country – in terms of the legislature in parliament, hopes and plans for the future as well as finances. The European Central Bank (ECB) 1 January 1999 will be floundering around indecisively with the Solar Arc Sun conjunct Neptune, exact in four months; and facing a series of disasters with tr Pluto square the Mars/Saturn midpoint in 2019/2020. More bubbles of false hope will burst in 2021 with tr Neptune conjunct the ECB Jupiter and the discouraging challenges will continue on with tr Pluto conjunct Venus and square the ECB Saturn until late 2022. The UK/EU relationship chart has a teeth-gritted tr Pluto square the composite Saturn this year, continuing on from last year; and a confused and disappointing tr Neptune opposition the Jupiter till late this year. Plus the July Solar Eclipse hitting the composite Capricorn Sun. But nothing that looks too definitive and nothing much beyond that. Not much the wiser and nothing new but it’s useful to highlight the main points again. After the shocking devastation of Notre Dame, I hope the French government decides to commission a totally new, innovative element, a thing of beauty, to complete the building to symbolise our faith in the process of life and in our future. Centuries of people’s love and trust in that great building and what it represented need to be honoured and let go to be integrated into a new structure. The patina of centuries of faith, love and wonder cannot be replaced or recreated and we shouldn’t try. I’m not optimistic. At the time of the bombing of the two towers, I hoped that it would lead to a recognition and acceptance that the old way of politics wasn’t working and that we needed to change. What did we get? Same old, same old. Spurious excuses to go to war against a country that was not even invoked in the disaster. We need to start a new approach somewhere and why not with a glorious rising of the new from the ashes of the beautiful, irreplaceable Norte Dame? A beaming light in the desperate, flailing mess of now. What does the astrology indicate, Marjorie? Any chance? As always, many thanks for your many insights and hard work. Paris Notre Dame is in flames. The same night Macron was supposed to give a major policy speech. In a strange way, this might bring common Europeans together. This is one of the most visited, if not the most visited, school trip sites on Continent. We have a truly emotional attachment to this place. I only just got home and got the news. This is indeed a major catastrophe not just for Paris or France, but for the world, especially the worlds of art and history. I have been to the Notre Dame and its grandeur, space and height uplifts one’s mind. The history it will have witnessed (since the 1200s), oh the stories the walls would tell us if they could talk. My sympathies with the Parisiens and the French as they recover from this massive loss. If the EU hits trouble sooner, then maybe they will make the UK a better offer. De Gaulle realised that our economy was out of kilter with those of the EU, which is why we end up contributing an out of proportion amount to EU funds. My experience when the Article 50 invocation letter was delivered leaves me to expect that this process, however it ends up, will be a mercy for both the EU and the UK. As a EU citizen I hope the UK decides soon what it wants to do and we can move on. I am no fan of the Brexit process and the current government has made a complete balls-up of the situation. However, what that process has also shown (me at least) is that the EU is as inflexible as a corpse crucified on the Fixed cross in its chart. It is fine to have principles, but those principles must be balanced by real-life concerns and an essential part of life is squaring the circle between idealised principles and real-life concerns. 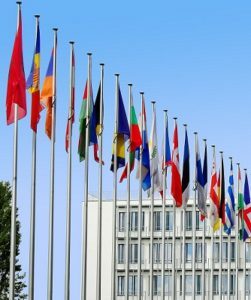 The EU has stuck to its guns and undeniably won, but at the cost of generating a certain amount of dislike (and hate). We may be stuck in this marriage, but that does not mean that there is any affection in it. I can’t imagine why the EU would want to hold on to a member-state where half the citizens detest and despise it. I absolutely hope that the crises that you hint at causes a major breakup of the top at the EU and a major change of direction. To start with, I hope that its principles are slapped in its face, so that it realises that those principles are not that great a shake. I hope that Juncker (whose term as EC President finishes the day the Brexit extension is supposed to end; 31st October) goes down in history as the person who started the disintegration of the EU by holding on too fast to his principles. As an aside, it was predicted on another site that this year will likely see another immigration crisis hit the EU, with possible riots accomanying it in France and possibly Italy and open hostility to immigrants across the EU. Given that May is when one could possibly see a spike in boats crossing the Mediterrenean, that may have a massive impact on the European Parliament elections. The recent events in Sudan and Libya may see knock-on impacts on these boat crossings. Do you see anything in the charts for Sudan, Libya, France or Italy that would suggest such a possible interpretatiion? Well here’s a thought. As his departure is due on a mercury retrograde, perhaps a delayed extension. Urh! Which site predicts the next refugee crisis? Euro crisis showed EU’s true colours. Brexit reinforced it. Astrology gives a reason why EU behaves this way.